For the NHL-leading 10th time this season, the Vancouver Canucks have rallied to win a game when trailing after two periods. Tuesday night's win in Colorado was especially impressive. 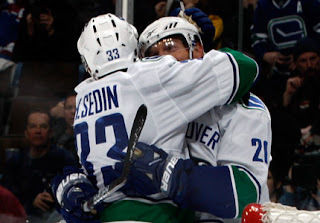 Trailing 3-0 after one period, and 4-1 in the second period, the Canucks tallied five straight goals to win 6-4. This comes amidst their record 14 game road trip, and a 19 game stretch where the Canucks have gone a very impressive 14-5 in an equally impromptu manner. Since January 16th, when the Canucks pummeled the defending Stanley Cup Champion Pittsburgh Penguins, the Canucks have gone 14-5, despite only scoring the first goal in 5 of those 19 games. While it is certainly a non-traditional and risky way to obtain wins, it may give them the confidence entering the playoffs that they can come from behind. This is definitely a refreshing change from old NHL games and dare I say old Canucks games where the style of play, and offensive potential of the group did not allow for such comebacks to occur. While Head Coach Alain Vigneault obviously desires better starts to their games, he certainly cannot complain about the heart shown in turning many of those poor starts into wins.